Read these poems about faith to encourage you, reminders of how awesome our God is. Verses about belief and our convictions. Be inspired and encouraged. I belong to a privileged family, so much is expected of me. I'm part of a royal heritage, I'm actually royalty! No royal robes on my person for functions which I would dread. But through my Mediator, I'm more than what I might seem. He is the One who has blessed me, He hears me whenever I call. Through Jesus I'm heir to salvation, through Christ I can do anything. He gives me a longing to serve Him. He walks by my side every day. Till then I'll go where He sends me, at home or some foreign shore. And God will someday reward me for things He's assigned me to do. God does not judge you according to the talents of others. measuring faithfulness is how faithful you are with your own gifts. If you've been teaching him how to live right. In his dark hours you show you still care. Have caused him to doubt and let Satan control. "He may walk away but I never depart." No matter what tactics Satan's employed. Is not of despair! God hears your pray. God sees the depth of your love for your son. Give God the reigns that your fears may take flight. 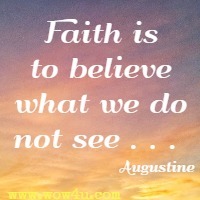 to see what we believe." I long for morning light to come, my heart feels so depressed. And all my efforts seem in vain, as if my years were spent. I had the will, the fortitude, as if on holy grounds. Excitement filled my very being, my heart filled to the brim. The wonder that God wanted me, that I could work for Him. Then I determined in my heart to give the Lord my all. Naively I surrendered all and felt I would be blest. I walked in total trust and faith; I thought I was secure. If I had known the cost I'd pay, I’d never followed through. But how was I to know the cost that comes from giving all? The suffering of my broken heart and how it hurt to fall? I fell beneath the heavy load, my eyes now dry and sore. How could a God of love and grace refuse to do His part? I never thought to look to God and ask His point of view. A still, small voice of tenderness I hadn't heard before. With open arms He beckoned me, "It's here you'll find relief." But you refused to hear My voice, you bulked at my appeal. Yet I"m still here, I"ll guide you through, I"ll help you carry on. For in this vale where darkness dwells, the clouds will soon be gone. And though it all seems hopeless now, there is relief from pain. And let Me heal your broken heart, PLEASE! Let Me set you free." I saw no light, I heard no voice, and yet I knew He's here. I felt a presence in my soul; I knew that He was near. The overwhelming evidence, the calm, yet stirring zeal. I could not verbalize my grief; I could not bow in prayer. I knew His Word said, "Come to Me." But how could that atone? My soul could not cry out to God, it could but weep and mourn. He saw my never-ending tears, the darkness of my night. To grant me hope that faith exists, to still my heart's deep fears. There is no soul beyond His reach, no place on earth to dread. In time my broken heart will heal, God will remove my grief. He doesn't push, He doesn't prod, but firmly leads the way. 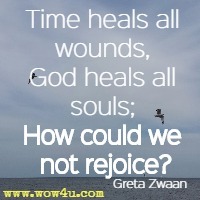 Time heals all wounds, God heals all souls; How could we not rejoice? The burden-bearer of our grief draws near with gentle voice. Faith comes from the work of God, not from the years man's striven. In submission to God's will, love and grace enfold them. But through a willing heart and mind, faith lets him believe it. Gives him wisdom to discern, to bring peace to the nations. He doesn't seem to understand God’s great salvation story. Reluctantly acknowledging, I ask, but with resistance. But folks say I should try You out; I say, that’s an allusion. Perhaps this problem You could solve, this weight that keeps on growing. Asks nothing in return from you except that you adore Him. His Son was held accountable; you've nothing to despair of. It's freely offered as a gift - by grace, not by your merit. Together, walking down life's road, a wonderful alliance. I'm not impressed with your deeds. You're mirrored in self-serving deeds. You frown at the weakness of man. It's part of your devious plan. They merit no honour with Me. A darkness I've come to set free. 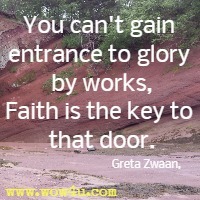 Faith is the key to that door. There's not one more thing you need to do. The door will be opened for you. And why each thread is so. Leads those who trust in Him. 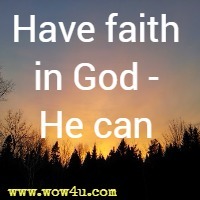 Have faith in God -- He can. Canst thou paint the clouds at eve? Have faith in God - He can. Thank God for the gifts that are heaven sent. Give thanks for all that you've got. Share them with others again and again. With others and those dear to you. 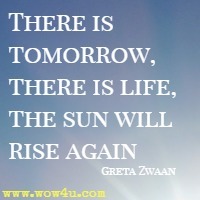 It will make life worthwhile tomorrow and today. But more importantly it helps you to grow. Give thanks rather than cry. Don't let life get you blue. 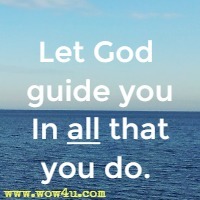 Let God guide you In all that you do. God my light, guide me every day. Never, ever, lead me astray. When you see that trouble's near. I do not worry, Lord, you make it clear. God my light, you are my strength. you add an extra length. Take this ship, through the storms of life. Make it stronger through all the strife. God my light, let my candle burn. So all can see and live and learn. Lord, never let me hide this flame. So I can be with you in Jesus's name. So much to gain, so much to lose! and certain of what we do not see." Do you count your blessings and realize all is fine. As God will always be there no matter what your cares. Will You walk along with me as I journey through this life? Will You comfort me when I am in distress? Give directions so that I won't have to guess? When each footstep that I take seems filled with pain? Will You give me hope and help me start again? For my tears are with me every day and night." I can only pray and leave my fate with God. Hold my hand, and by Your love my faith renew. Man cannot be hung on gallows if his voice has once been stilled. No one has the power to change things, fate unfolds as life designed. A mere flicker, oh, so tiny, daring to disrupt the night. Earthly sins require payments but there's healing for the soul. Mercy draws a contrite being; God! How wonderful Thou art! Christ's redemptive power has conquered, all is well for Christ is near. Working throughout my entire life's span. I am assured that He does all things well. Feeling a failure day after day. Endlessly searching to find out God's will. Filling me, thrilling me, God is still present! I need not worry, He's in full control. So many factors are yet incomplete. Silently waiting, for God is discreet. 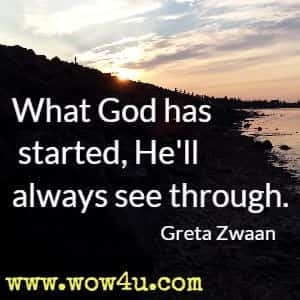 What God has started, He'll always see through. It thrust its force with deadly aim, with vicious, mighty furor! It stormed the shores with mighty waves - no time to be evicted. The thundering crashes of the sea, its fury was unloading. The roar of power covered all, the crush could not be halted. Everything was swept away - gone! as if unneeded. News was flashed on TV screens, "The violent storm asserted!" All was caught within its path; the power, so compelling! No one there to save their lives; it sent the world to mourning. Why was there no one to alert? To give the cry, "DISASTER!?" "Run for your lives! Be in great haste! Lest death become your master!" The water rose to tops of trees! The scene was worse than gory! The silence, deafening as the storm, now in its place had centered. The horror that had gone before was like a burning acid! These lives had taken years to build now gone within the hour. Whom do we blame? What can we say? What comfort can be given? The ones he loved and held so dear, they'd never be returning? The victims of tsunami's power in watery graves were flaunted. Can man rebuild? Can hearts be healed? Is there hope for tomorrow? 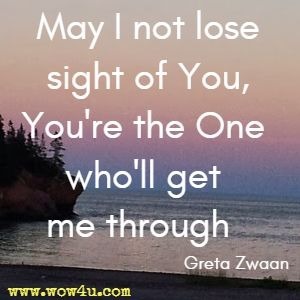 Will grief move on and lives pick up? Can comfort come in sorrow? In love and mercy He'll draw near; in tenderness He'll hold you. For everything the Lord begins He'll see through to the finish. With earthly treasures all removed your life's still taken care of. But when there's no place else to turn, we know He knows - He saw us! So turn to Him! In all your grief, His love no storm can sever! By faith we reach out expectantly turn the page and take a look. He writes His love in many ways, in sunny days, through darkest night. Find the faith to walk rejoicing, sing His goodness in our heart. But time goes on and comes the challenge of tomorrow's untried races. Boldly make a new beginning and trust the ending to His hand. Picking up the "left behind," gathering, sifting, screening. Hoping for a basketful, that's what really mattered. Daily she resumed her task, seeking for the blessing. She had come, she knew her heart; Naomi's God had called her. When she saw God's tender love, O how it had enthralled her. Gathering up the fallen grain that Boaz once had sown. Diligent, with steady hand, that's how Boaz found her. How Naomi's life was blessed, and how she did adore her. Reverence and a tender heart helped her fill her mission. Are you like Ruth? A willing one? Gathering in the fallen? Seeking souls that walk in sin? Do you hear the calling? Introduce them to the Lord, Christ who loves each stranger. Do Christ's bidding, bring them in, for the Lord has spoken.